Did you know that just three buffalo wings have 10 grams of fat? (Who eats just three?) This soup has all the spice, creaminess, and tang you crave--with a fraction of the fat. Did you know that just three buffalo wings have 10 grams of fat? (Who eats just three?) This soup has all the spice, creaminess, and tang you crave--with a fraction of the fat. * choose a pepper that's right for your heat preference. An Anaheim pepper is milder and that's what I used in this recipe. Hot sauce is packed full of salt. I chose to use spices to add flavor then add a bit of hot sauce for tang. 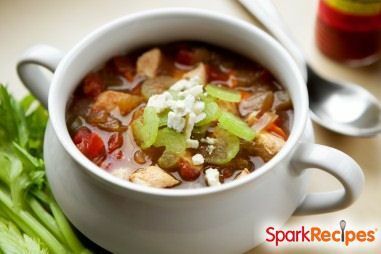 Place all the soup ingredients except for the hot sauce in a slow cooker, and stir to combine. Cover and cook on high for 3 hours or low for 6. Before serving, stir in the hot sauce. Top each bowl with 1 teaspoon blue cheese and chopped celery. This soup is "medium" in terms of heat. For "hot" soup: Choose a hotter pepper, and leave the seeds in the pepper. For "mild" soup: Stir 1/4 cup Greek yogurt into 1/2 cup of the hot soup, then stir the soup-yogurt mixture into the rest of the soup. (This step prevents the yogurt from curdling.) The yogurt will add about 25 calories and 1.6 grams of fat to each serving--not calculated in this recipe. Serving Size: Makes 6 cups. I'm glad I read the comments first, then I know what to expect when I make the soup. It still sounds good.